Yesterday there was a mass shooting at a school in Oregon. It was the 994th mass shooting in America in the past three years. We’ve lost over 1200 people to these shootings in the same time frame. I have a group text message with some guys I went to college with. We talk so often that my wife calls them my boyfriends. On Thursday morning I was listening to ESPN Radio. One of our favorite radio hosts was talking about violence in football. He mentioned three high school students have been killed playing football this year. The Boyfriends and I started talking about what it would take for America’s love for such a violent sport to change. We all agreed football was dangerous, but all admitted we weren’t going to stop watching it. One guy even said football players are the new gladiators and we’re just sitting around watching guys get killed. On Wednesday night, Trevor Noah did an entire segment on race relations in America on The Daily Show. In the segment, the correspondents satirically looked at how everyone has racial biases. The white correspondent jokingly acted like all black people were criminals. The black correspondent joked that all cops hated black people. The segment was satire, but it represented how many in America feel, even if they’re not willing to admit it. In 2015, the United States are just as divided racially as it was in 1985. We like to think we’re a progressive society. We look at history books and scoff at how backwards previous generations had things. With the benefit of time and hindsight, we make negative judgments of people, actions, and decisions. At the same time, we emotionally react to the crisis of the day. We pass laws to put bandaids on social issues. We hope that if we make something legal or illegal, we’ll suddenly make people treat each other better. What we don’t look at often enough is the root of these issues. We look at symptoms of the root – racism, anger, violence – but never the actual root. And that’s because the root of the problem has become a four letter word in our society. It’s something many pastors gloss over and even fewer Christians feel comfortable dealing with. Before sin entered the world, there was no murder, racism, or violence. Sin entered the world in Genesis 3:6 when Adam and Eve first ate the fruit they weren’t supposed to eat. After getting a stern talking to from God, it only took five verses before we see anger and murder. And the Lord regretted that he had made man on the earth, and it grieved his heart. Sin makes us do things that are so horribly evil that it makes God regret he even created us. And here we are thinking politics and policies can fix things. As Christians, we’re definitely called to play a part in the government, but it’s not our first calling. Our first calling is to point people to the only thing that can take away the sin that causes all the issues: Jesus. 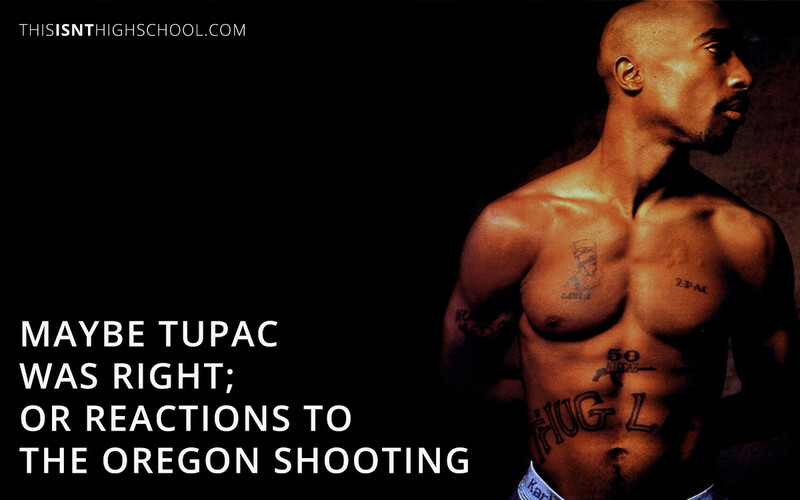 So what’s all this have to do with Tupac? It’s time for us as a people to start making some changes. Let’s change the way we eat. Let’s change the way we live. You see the old way wasn’t working so it’s on us to do what we gotta do to survive. What he didn’t realize (or maybe he did, I don’t know) was that the old way doesn’t work. The sin nature we’re born with cannot and will not work. The only hope we have is Jesus taking away the sin and giving us new eyes and a new heart. Until we reach the world for Jesus, some things will never change. We’ll never get rid of racism. We’ll never get rid of violence. We’ll never get rid of anger. Too often after crisis events like Oregon, we get emotional and want to pass laws to keep things like this from happening. Or, depending on our political leaning, we get emotional about how the emotional people wanting to pass laws are stupid. What we need more than policies and laws is a generation of people who love Jesus and will do anything short of sinning to introduce people to him. That’s the only way things will change. (I handle some of the Awana social media duties, which is how I found you…didn’t want to @reply there, because I wanted to respond as myself). Thanks so much for reading and commenting, Seth. That means a ton. And I totally get not replying from the Awana social media. And yes, college/the NFL seems to be just watching people die.